Editing photos on your iPad is extremely enjoyable thanks to its large glossy touchscreen. Armed with a great photo editing app you can be manipulating and fine tuning your photos wherever you are – you're certainly free from the shackles of the PC when it comes to making the most of your images. It's totally feasible to edit a batch of photos and share them via social media during your morning commute. But the selection of image editing apps on the market is vast and knowing which one will suit you best can be confusing, so we've tested all the iPad photo apps below. Find your perfect partner and get creating. If you use photoshop.com already, Photoshop Express is the natural extension of this service on the iPad. Adobe lets you share images between your online account and your iPad, use most of the features on the site using your tablet and it also ties in with any Adobe Apps on your desktop.You'll find editing your images a simple and enjoyable experience – we highly recommend the effects pack (£1.99) which allows you to apply professional looking effects that would take hours to create from scratch in Photoshop in just a few seconds. And then there's the paid-for Photoshop Touch. The ultimate editing solution for the iPad, Photogene handles all the important editing tasks with ease, from removing redeye to making collages. The editing tools it offers are both impressive and powerful. 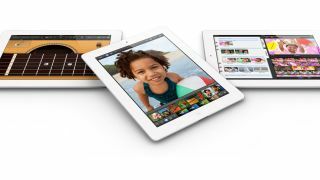 The interface is intuitive and makes the most of the iPad's touch screen. Equally as good for adding quick effects and undertaking detailed edits. If you own a DSLR, you'll be pleased to know it can open up for editing very large files and supports an export resolution of up to 21 MP. Luminance manages to combine a fuss free elegant interface with professional editing features. It's a steal at 69p. As well as a full set of advanced editing features and effects, this app gives you the ability to copy edits you've made and apply the same effects to more photos – great if you're creating an album and want a coherent look. Better still, each effect you add to a photo in Luminance is applied as a layer, so you can see how applying in a different order effects your final look and delete individual elements without having to start over. Awesome. If you're really into photography you'll love Filterstorm. Designed from the ground up to meet your iPad (and iPhone) photo editing needs, the suite has a toolset suited to serious photographers, rather than gimmicky effects. It has everything you could need in an editing suite including layers, curves manipulation, color correction abilities, noise reduction, sharpening, vignetting, and black and white conversion fine-tuning. You may never need your desktop editing suite again…It costs £2.49 from the iTunes App Store. Intuitive and fun to use, iPhoto is a great all-round editing suite that seamlessly combines power with ease of use. Professional looking edits can be achieved in just a few minutes and adjustments really are easy – make the grass greener with a simple finger swipe! We can't get enough of the app's swatch book – lots of beautifully photo effects ranging from dramatic to subtle, applied within seconds. Choose iPhoto if you want to change how you edit your images in your iPad and make your workflow quicker. Snapseed has been developed from scratch as a touch app and this really shows when you use it – it's a powerful piece of software that even allows you to exploit the extra bit depth from your DSLR's RAW files to make wonderfully creative edits, without the need for a computer. Snapseed's customisable effect presets are nothing short of brilliant either – a few minutes spent in Snapseed could pass for hours work on the computer… Undoubtedly the best free editing app on the market. PhotoToaster Jr. features a plethora of one click effects and settings allowing you to instantly improve your images or alter them significantly. From effects like Lomo and HDR through to vignette and boarders, PhotoToaster offers way more than you'd expect from a free app – you even get lighting level adjustment tools to lighten shadows and recover highlights! The simple interface is easy to use and extremely quick and you'll find the multiple undo handy if you're new to editing. If you get on well with this free app consider paying £1.49 for the full version of PhotoToaster, which offers full control, more effects and social media integration. We love PicShop HD's clear, crisp interface and the fact that it's just so easy to use. Our favourite feature however has got be that you can load pictures directly from your Facebook account and the integrated social media sharing means you can send your edits directly to your Facebook, Twitter or Email accounts with a single click. Impressively, the editing suite handle HD images up to 8MP, but its feature set is more suited to those who want to make simple edits like cropping, red eye removal etc. rather than colour correction, layers and so on. The range of effects and filters on offer are great and you also have frames and the ability to easily add text, sketches and even stickers to your images.